A couple of years ago Rick Stein went in search of his ancestors in Germany and attempted to make a case for German gastronomy. It is true that many German chefs can execute – in both senses of that word – French haute cuisine with faultless precision, but that hardly reflects the usual diet of sausage, cabbage and potatoes that Rick manfully attempted to extol in a typically winning fashion. It may be possible to enjoy curried bratwurst – a hungry man can enjoy most things – but I suspect in Rick’s case it was more a “triumph of the will” rather than a seduction of the spirit. There is, on first glance, a striking disconnect between the prosaic oafishness of German food and the extraordinary intellectual complexity and exquisite pleasure afforded by the wines. This accords with our equivocal attitudes to the Germans on a larger scale: it has never been easy to reconcile our respect for the world of Bach, Beethoven and Richard Strauss with the less admirable episodes in German history. “The great German growers make wine for wine’s sake. Matching it with food is a secondary consideration, although the current German taste for drier wines has made it into a vogue in certain circles.” Hugh Johnson wrote those typically prescient words in my copy of the 1986 edition of his Pocket Wine Book and the divergence – or diversity if you wish to accentuate the positive – has grown exponentially ever since. The old perception of German wine, of Rieslings with a racy balance of sweetness and acidity, best enjoyed while watching cricket in a deck chair on a June afternoon is somewhat outdated. In a sense it has always been a little inaccurate. 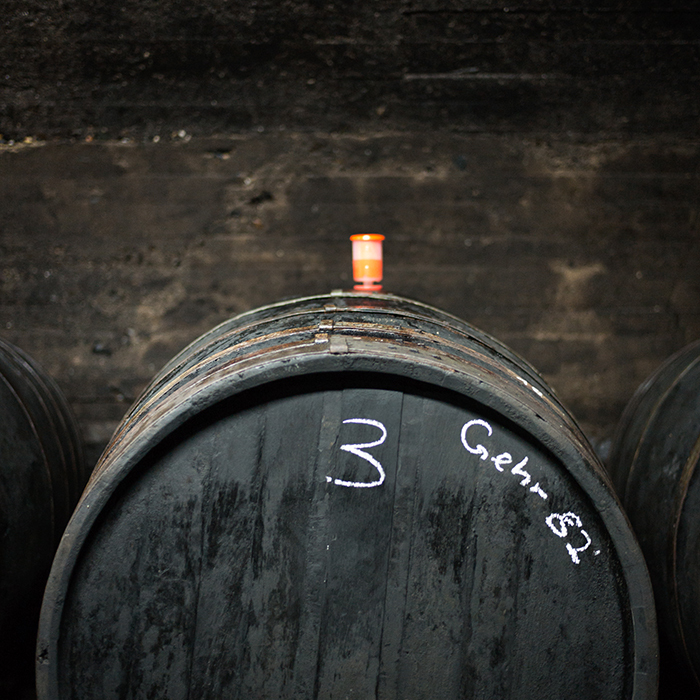 The biggest market for German wine is, obviously, Germany – and they have always wanted wine to drink with food alongside their more rarefied Spätleses and Ausleses. By and large, that means dry (or Trocken), styles, especially with the, let us call it, “robust” quality of most German food. Trocken used to be a bit of threat rather than a treat, denoting a dry austere style, but global warming, modern wine-making techniques and the decline in the market for traditional styles have completely changed the picture. There are a large number of Trocken wines that are stunning: still on the austere side, perhaps, but with a backbone of intense minerality and depth that gives any Alsace producer a run for their money. There is another reason the deckchair image of German Riesling has fallen out of favour. Give a nice glass of five-year-old Mosel Spätlese a little sniff. It is probably quite floral, with a citrusy zing, perhaps a hint of a strange, petrol nose. Now drop a little on the front of your tongue. It is sweet. Really quite sweet. Now rinse around the mouth and the edges of the tongue will (or should) pick up that zippy acidity and then, when you swallow, the finish might even be quite dry. This is what they call the tightrope walk of sweetness and acidity that characterises the wine. However, that initial and defining sweetness will have done for it with most wine drinkers today. Sometime about 50 years ago, any wine with any lingering sweetness became distinctly unfashionable. One would specify “dry” white wine when ordering a glass in a pub if one was sophisticated. Notwithstanding the fact that any off-dry wine served in a pub was probably pretty sickly and confected, this move to dryness chucked the baby out with the bathwater. “I don’t know how you can drink that stuff,” was the response to a very decent bottle of Ch. Rieussec wasted on my children at Christmas. Sherry, for years in the wilderness despite any evangelism on my part, is now fashionable again: perhaps sweet wine may also enjoy such a renaissance. But German wine does not necessarily mean Riesling, which only accounts for 20 percent of total German wine production. There has been an increase in the production of Weissburgunder (Pinot Blanc, not Chardonnay) and Grauburgunder (Pinot Gris), often oaked and full, rounded wines that would fool most of us as white Burgundy in a wine options game. Then there is a huge amount of less interesting stuff (have you ever been offered a nice glass of Müller-Thurgau?) and quite interesting stuff (Sylvaner, Scheurebe) that is drunk in copious quantities to wash down all that sauerkraut. It is worth remembering that, just as in Britain, the real market in Germany is dominated by what sells in the likes of Aldi and Lidl and that market is supplied, unlike in Britain, by the domestic produce. The only problem with German wine is that, although it remains resolutely out of favour here, the good stuff is not especially cheap; there is still a prosperous domestic market. Those of us who have been buying, selling, drinking and extolling the virtues of German Pinot Noir can only claim that it beats a lot of Burgundy on merit, rather than on price. Despite its being an endangered species, it is the old-fashioned, low-alcohol, high-acidity, dripping with residual sugar style that is unique and, to my mind, still the most exciting of all German wines. Part of the excitement is their singularity: nowhere else produces wines anything like them and it will be a poorer world if this point of difference is eroded by a drift towards a more standardised, global style of winemaking. And so the question lingers, what do you eat with these nervy thoroughbreds? In a way the question starts with a false premise. Part of the problem is the idea that drinking wine is OK if you are eating but degrading, dangerous and decadent if enjoyed for its own sake. One of the beauties of this lower alcohol wine is that you can share a bottle for elevenses on the morning Eurostar, have it as a little refresher after dinner, sip some over another episode of Spiral or Better Call Saul or, yes, it’s absolutely perfect with an afternoon’s cricket. And yet you might be surprised just how well these wines do accompany a lot of food. The golden rule of wine matching with desserts is that the wine should be slightly sweeter than the food but that is only the half of it. Food and wine matching, or the art of complementing flavours, is not a simple business. For a wine’s sweetness to “complement” a food it may bring out the intrinsic sweetness (of peas or crab, say) or it might add an element of sweetness that is missing. This can explain why “umami” flavours, intensely savoury and with no obvious sweetness can pair with really quite sweet wines. Blue cheese and foie gras – not together please – are known to work well with Sauternes and by the same token Auslese, although often more beguiling, works a treat too. These wines, complex in themselves, can deal with complex dishes normally considered difficult to match. Try my recipe for white asparagus. 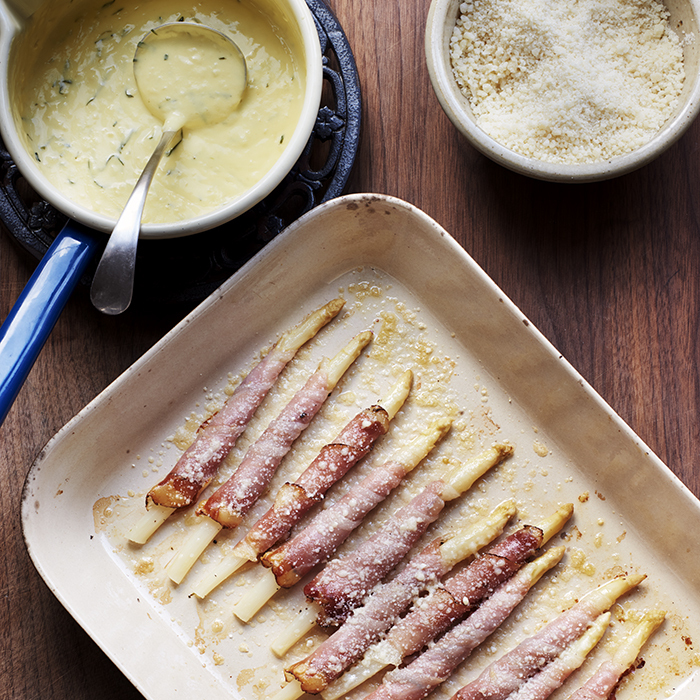 I boil them until cooked through (no al dente nonsense) and then roll them in butter, Parmesan, wrap them in speck, brush them with more butter and sprinkle them with more Parmesan and then bake them in the oven for 10 minutes. They are very good with a glass of Champagne, but the best match of all is a Spätlese: the sugar is a perfect foil for the bitterness of the asparagus, while the acidity will cut the rich umami of the butter and cheese. 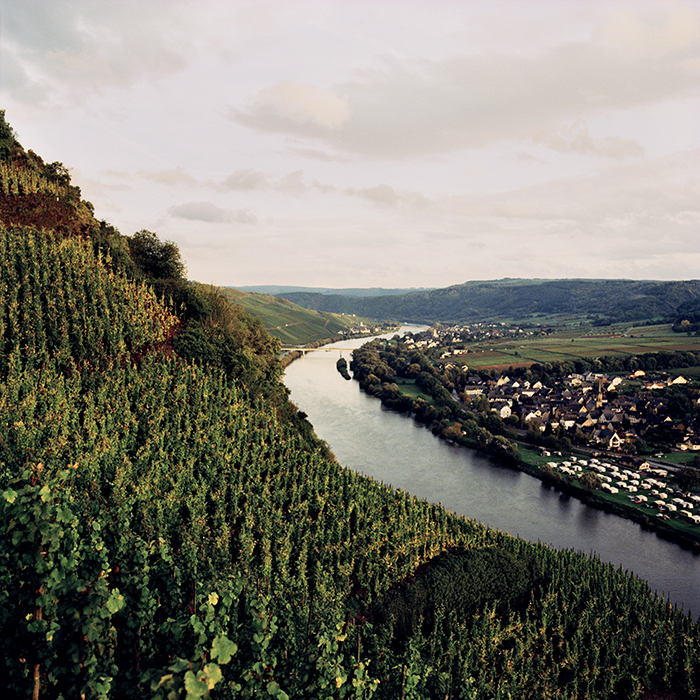 The litany of what works with traditional German Riesling is a long one. Cheese is pretty obvious. A light, herby sort of cheese – a goats’ cheese perhaps, or a fresh Lancashire – will love the bright caress of a Kabinett; a Cheddar or a Comté deserve a good mature Spätlese and an Auslese will mop up just about anything although you might want (purse permitting) a Beerenauslese for a recalcitrant Roquefort. Residual sugar is just the ticket for what we call “Asian flavours” where most wines fade on sight of a bit of coconut, coriander or chilli. Seafood and smoked fish also enjoy the bright acidity and lack of oak that Riesling offers. The great man thought for a moment and then opined, “I think it goes very well with… [long pause]… television.” Auslese is a bit like that. Especially when the cricket is on.